This past year reminded me – layer shedding layer – we share … the gift, the grace of timing. Timing has a way of syncing presence & perspective… toughening … & tenderizing … in inexplicable… striking … soft & strengthening … yet fragrant ways. and darkness taunts … hours, annoyance, anxiousness, arrogance act as if they’re conspiring… smothering the light. My earthbound eyes widen … failing focus & fixate in earnest… away from the eternal. or the barren press from within. I step in & we dance. a whole well of heart-holding enduring. hallows the beauty with a enduring beat. beyond feeling to His Pressing Joy. But when you ask him, be sure that your faith is in God alone. as a wave of the sea that is blown and tossed by the wind. for God has honored them. And those who are rich should boast that God has humbled them. They will fade away like a little flower in the field. the little flower droops and falls, and its beauty fades away. In the same way, the rich will fade away with all of their achievements. 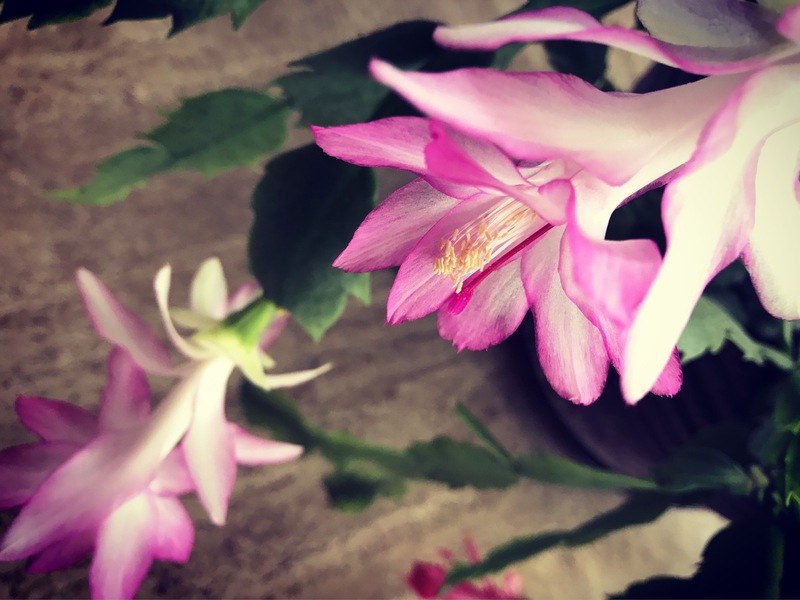 One of the wonders of all this… is this Christmas Cactus that slumbered through Advent and winter knew to bloom for us through Lent and Easter this spring. Dormant seasons are easily misunderstood ones. Grateful for Grace to Grow again.